Catalina sailboat in need of bottom paint repair. VC Performance Epoxy on bottom, wet sanded and polished. Why are Barrier Coats and Bottom Paint necessary? 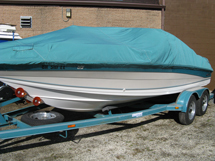 Gelcoat is a porous material and will absorb moisture when your boat is left in the water for an extended period of time. The water entering the hull chemically reacts with the glass fibers and uncured resins. This reaction produces pressure which causes blistering and cracking in the surface. Once blisters and cracks start, the boat’s laminate will absorb water like a sponge. 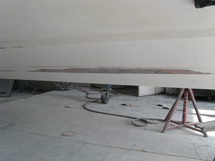 Antifouling paint alone will not prevent this from occurring; an epoxy barrier coat must be applied to seal the hull prior to bottom paint. The barrier coat will protect and seal the hull. 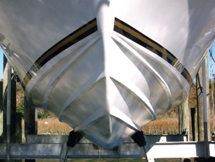 The antifouling paint provides protection against barnacles, mussels, weeds and slime. Protection is always better than the cure. 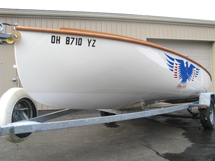 Our most popular bottom paint is Vivid antifouling paint by Pettit. 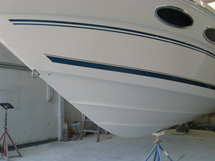 It is a hybrid high-performance, multi-seasonal, dual-biocide antifouling paint. It is available in a bright white finish which is our most popular color choice. 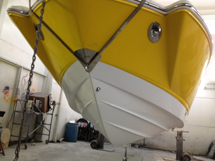 Other colors can be custom mixed from the six base colors to match or compliment your boat color. Preparation, high-quality products and proper application are key to having a long-lasting paint job. 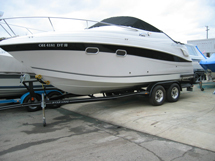 All boats are lifted off trailers and safely supported on stands in our climate-controlled paint room. Moisture levels of the hull are determined; if levels are too high, they are corrected before proceeding. This is the most critical step in the process. Entire boat, excluding bottom, is covered and masked off including around drive. Surface is washed and de-waxed to ensure all contaminates are removed from hull. Entire bottom is sanded with 80 grit paper to achieve a uniform dull, frosty finish. Inadequate surface preparation will result in failure of paint adhesion. Bottom is then cleaned again. 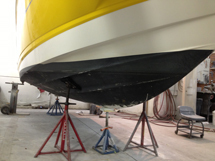 The hull can now be inspected for deep scratches, cracks, chips, or blistering of the gelcoat. At this point, any required repairs will be made. Barrier coat (four coats of epoxy barrier coat primer) is then applied (total dry thickness 12 mills). 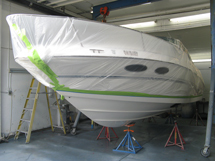 Three medium coats of antifouling paint are applied which offers multi-season protection and optimal performance. 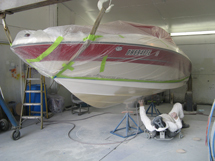 All of our coatings are sprayed (not rolled) in a heated paint booth which ensures even application of the product, smoother finish, complete consistent cure and creates less drag on your boat. Entire surface is sanded with 80 grit sand paper to ensure removal of all contaminates and ensure maximum adhesion. Two coats applied by spraying. 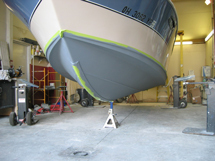 Different types of antifouling paint are available for types of environment and uses. How long before recoat is needed? Recoats are needed because antifouling paints, depending on the type, can release all their biocides or slowly wear away like a bar of soap. Intervals between recoats can vary depending upon product used, type of water conditions, and usage. Man-made pollution and natural occurrences can affect antifouling paint performance—water temperatures, silt dirt, pollution and water flow. VC Performance Epoxy is an extremely hard, two-component epoxy that contains Teflon. 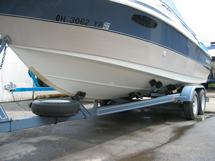 It has been designed for use on boats that do not require antifouling such as trailered or rack stored boats. The hard white finish resembles the original gelcoat and will resist scuffing, marring, and staining of the surface. 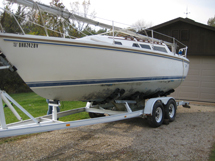 This is a much more economical alternative to re-gelcoating a severely damaged boat bottom. If your boat bottom is in poor shape, this a great option. The above boat was brought to us with bottom paint incorrectly applied. The bottom was not prepared and no barrier coat was applied. The black bottom paint was falling off. We aggressively sanded the bottom, removed all the black bottom paint and exposed fresh gelcoat. 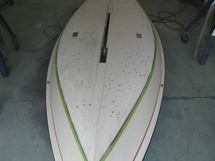 Four coats of epoxy barrier coat and three coats of Vivid white anti-fouling paint were then applied.